Keeping an energy efficient home is beneficial to the planet, the economy, and your wallet. The options available to homeowners for eco-friendly and energy efficient possibilities are steadily growing. From building your dream home to fixing up and older home there is a wide variety of potential energy saving additions for your home. For those that aren’t planning on building a new, eco-friendly home any time soon, here are some fixes for your home to help save energy at home that you may have overlooked. Energy efficient window treatments are practical and necessary additions to your home. Chances are you are using window covers for decorative purposes already, so why not consider the wide variety of options for energy saving window covers. There are blinds with thermal properties and solar protective coating to help keep lock in heat during the winters and reflect heat in the summer. Draperies are also helpful in insulating your home. 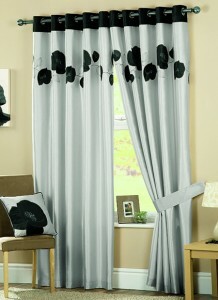 Hang your draperies close to the window and use Velcro to attach the material to the wall to help prevent heat loss. For electronics like the television, lamps, and kitchen appliances, it’s common to leave these things plugged in for convenience sake when you need them. Unfortunately, these things still draw power even when they aren’t turned on. Just unplugging your television can save you up to $100 a year depending on how many watts your television uses. But who has time to go unplugging a dozen different plugins every time they turn something off? The solution to this problem is the power strip. You can plug your television, DVD player, gaming system, etc. into the power strip and, instead of unplugging everything, just flip the switch. For garages that are attached to the home, there is a ton of opportunity for energy loss through faulty or old insulation and weather stripping. It’s easy area to overlook, but the garage door is the largest open area in your home allowing temperature transfer to your home. A simple fix like replacing the rubber seal can keep you from throwing money away. Remember to check the insulation in the garage door itself, but also the door connecting your home to the garage if the two are jointed. According to Energy Star, almost 90% of the energy consumed by a washing machine goes to heating the water. It’s always been believed that washing your clothes in hot water is the only way to really get them clean. This isn’t entirely true. Hot water is one ingredient in cleaning your clothes, but now many detergents are formulated to clean with cold water to make up for the loss of heat. Also, washing machines in general are becoming more efficient and better able to clean your clothes with cold water. The more you wash your clothes in cold water the more you help lower the amount of carbon dioxide emissions. In order to help with the abundant water consumption, be sure to switch to cold water washing as well as being sure to only wash full loads of laundry. For the coming summer months it’s important to take good care of your lawn. There are a many tips to help stay on top of your yard work in an energy efficient way without letting your yard suffer. For starters, when you mow your lawn leave the grass mulch on your lawn. It will keep moisture on your lawn and return its nutrients. When watering your lawn be sure to water in the early morning or at night when the temperatures are lower and the water you are using isn’t just evaporating before it has the chance to help your lawn. 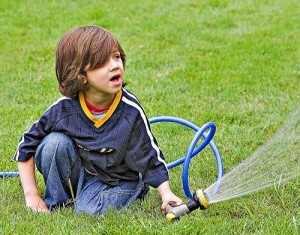 Sprinklers also use a lot more water than handheld hose watering, so consider alternating between hose watering and watering with your sprinkler system. Author Bio: Chelsy is a writer from Montana living in Boise, Idaho. She graduated with her journalism degree from the University of Montana in 2012. She enjoys spending time with her animals, attending music festivals, and exploring Boise.